Cleveland’s Ohio City neighborhood is full of great places to eat so it can seem almost daunting to pick a spot that everyone in your party will love. Luca Italian is a place that will please them all! From traditional favorites, gluten-free options and an exciting drink menu, Luca everything you could ask for in a great Italian spot. Being one of the only Italian restaurants in Ohio City (learn more), Luca definitely has an advantage, but they don’t really need it. The food speaks for itself. Locals love the “Sacchetti Al Tartufo Bianco” (White Truffle and Ricotta Stuffed Sacchetti, Tartufata Cream Sauce, Aged Fig Balsamic), the “Ravioli Di Aragosta” (lobster stuffed squid ink ravioli, tomato cream sauce, lobster meat, shrimp), “Cavatelli Al Forno” (baked ricotta cavatelli, tomato sauce, pancetta, barolo, fontinella cheese), and the “Gnocchi Di Patate” (traditional potato gnocchi baked, tomato sauce, crushed red peppers, fresh mozzarella cheese). 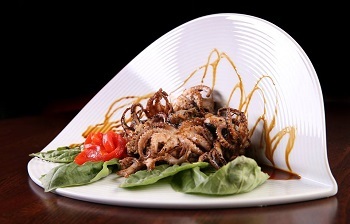 People also love the Calamari appetizer with its generous portion and delicious flavor. Since many of their dishes are very generous in terms of portion size, they also offer half orders of their pasta to make it a more appropriate size. They do only offer this during the week but it is a great thing to take advantage of to save some money, especially if you are not into leftovers. The large drink menu features some great wine selections. Plenty of options of reds, roses, whites, and champagnes. They also have a full bar where they offer Happy Hour from 5 pm – 7pm Monday through Friday and as a bonus they offer it all day on Sunday! People rave about how perfect the Happy Hour menu is. The drink menu includes wine, beer, coffee drinks and plenty of cocktails to choose from. On top of all those great drink specials, they also have a wonderful food selection. It includes the Calamari and also offers dishes like the “Carpaccio Di Salmone” (thinly sliced raw salmon, capers, red onion, lemon, EVOO) each priced at a low $6. One of the most important part of the experience for Luca customers is a wonderful wait staff. It has been said time and again that all of the employees are kind and very helpful. Most people ask for the waiter’s advice when it comes to wine pairings and beer choices. The wait staff is highly trained in this area and is able to assist with any request that may come about. Another big appeal of Luca is its beautiful decor, inside and out. The ambiance inside is quaint and romantic early in the evening. If you are planning on coming for a date with some deep conversation, it is recommended to come earlier rather than later. Things liven up pretty early–live music often starts around 6pm and the place typically stays pretty busy from there on out for the remainder of the night. Overall, a great place for Happy Hour which is also a great time to go while it is still quiet, and then watch the night unfold in this amazing venue. Stop in at the Ohio City location at 2100 Superior Viaduct Cleveland, OH 44113 Call the restaurant at: (216) 862-2761 or visit their website. 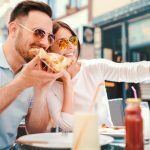 See more on our Best Restaurants Near Me page.